When evaluating patio furniture, keep the old proverb in mind, not all that glitters is gold. In as much that this statement is true for all patio furniture; it is especially true for outdoor wicker furniture. 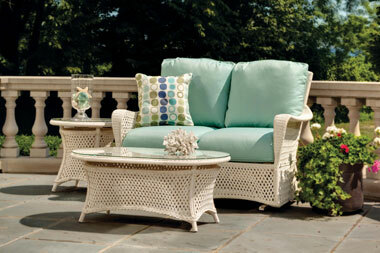 Outdoor wicker furniture is one of the most desirable patio furniture purchases people are making these days. People are looking for affordable quality patio furniture that looks great, needs very little maintenance, is comfortable and will last for years without having to worry too much about it. To ensure you end up with quality outdoor wicker , you need to start by doing your homework before you lay down your hard earned dollars to purchase your outdoor furniture. First, you need to try to identify retailers that hold experience and have a background selling resin outdoor wicker furniture. This is probably the most important step in acquiring your furniture because they will be the only ones who have any clue as to the quality of the product. Purchasing wicker from your local discount store or department store that only carry wicker during the spring season is chancy at best. For obvious reasons, these types of stores do not specialize in wicker products and probably could not answer one technical question about its quality or manufacture. Outdoor resin wicker can be manufactured in many different countries using many different resins, dyes and materials. You will only have the word of the salesman when you ask questions. You want the word of a professional wicker salesman who knows their products and stands behind them. Only consider a retailer that offers at least a 1-year limited warrantee against manufacturer’s defects. Then at least you know they are somewhat serious about their products. It is not recommend that you consider any wicker furniture that does not hold at least the 1-year warrantee. Just about any furniture will last a year. If you buy quality wicker furniture, you’re probably going to have it for at least 8-10 years and probably a lot more. Here are a few things you can ask your wicker salesman to see if they really know about outdoor wicker or are simply a charismatic salesman. You need to inquire as to the quality of the resin that is used. What you want to know is that the salesman recognizes that the resin furniture being sold has additives to resist ultraviolet (UV) waves. These are the sun rays that deteriorate plastic furniture the most causing it to become brittle and the finish to fade. It’s not a guarantee but, if your salesmen can talk about the quality of the resin, then there is a good chance that their supplier has passed on the technical specs of the resin. Ask about the type of frames used for the outdoor wicker furniture. If aluminum frames are being used, that’s good. If powder coated steel frames are being used, that is good, but not as good as aluminum frames. Powder coated steel is a coating on steel to keep it from rusting. The frames are heavier than aluminum frames. Steel frames will typically begin to degrade sooner than aluminum. If you’re strapped for cash, purchasing outdoor wicker with powder coated steel frames is your second best choice because they should be less expensive than aluminum frames. Evaluate the weave of the wicker strands. The weave should be tight for both open weave and close weave designs. Starting and stopping points within the weave of the wicker whip should not be conspicuous. The shape of the furniture should be uniform and symmetrical. For example, when you evaluate a chair, the left side should be symmetrical with the right. Before you become too picky, recognize one thing, wicker furniture is hand crafted. As such, there will be small differences in every single piece. But, overall it should look good. Wrapped ends such as at the end of the feet of a chair or loveseat or the joint of support braces should be finished so that there are no loose ends. There should not be any noticeable glued areas or rough finished areas. Many times in discount stores you might see displays with the wicker unwrapping. This is not a sign of a quality piece. Quality wicker furniture will take the abuse of many customers trying out the furniture and should not show any signs of deterioration. Reputable retailers offer at least a 1-year warrantee. Shop only where a 1-year warrantee for the wicker is offered. If you buy from someone that offers less, you may regret it.